A book titled ‘The Golden Jubilee: An Enduring Friendship’ was released yesterday to mark the end of the golden jubilee celebrations of the establishment of diplomatic ties between Bhutan and India. Her Majesty the Gyalyum Dorji Wangmo Wangchuck graced the ceremony. The book is published by the National Organizing Committee. The committee was formed last year under the Royal Command of His Majesty The King to coordinate successful celebrations of the golden jubilee. The book is a compilation of a yearlong celebration covering over 100 events. It also includes several important speeches from the events. 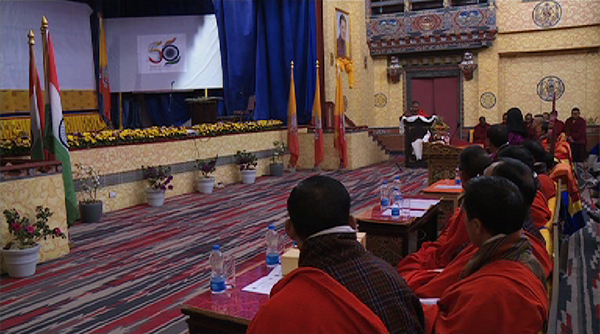 As part of the grand finale ceremony, a documentary highlighting the golden jubilee celebrations was also launched. Mementoes were also awarded to five former ministers and to the Indian ambassador to Bhutan, Jaideep Sarkar in recognition of their efforts in fostering friendship between the two countries. The celebrations, which began from January last year, saw the two countries hosting commemorative initiatives, cultural activities and exhibitions besides high-level exchanges. The various events held to set the tone for further strengthening of the relationship between Bhutan and India in the next fifty years and beyond. The two countries established formal diplomatic relations in 1968 with the appointment of a resident representative of India in Thimphu.